You’re driving home at the end of a long day, turn a corner and run straight into the sun. Bam! You’re momentarily blinded. You reach up for the sunshade, and twist it down. Ahhhh. Five minutes later, you’re home with a cold beer in your hand. 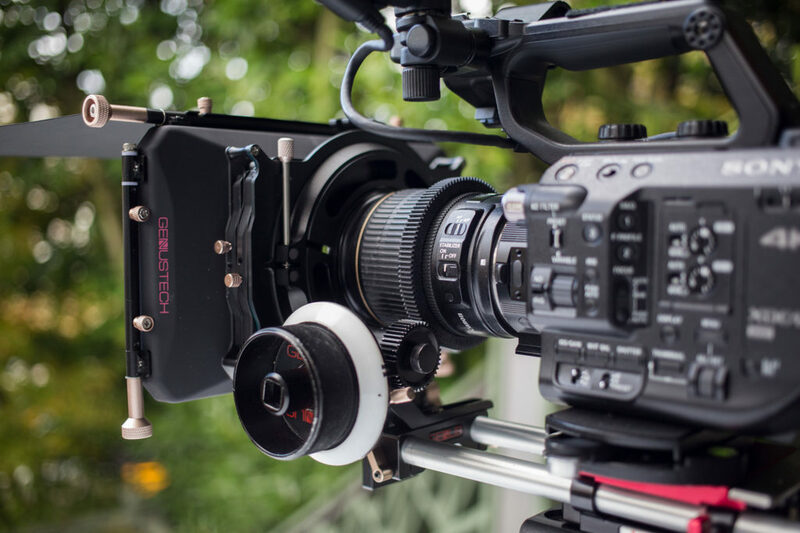 For most documentary filmmakers, having a matte box is like having a visor on your car. You won’t use it very often, but when you do need it, you’ll be glad it’s there. Unfortunately, however, a matte box does not come standard with a camera like a visor does with a car. There are a million camera setups, so there is an bewildering array of matte boxes. My own matte box journey began a few years ago when I picked up a Genus Matte box Lite. This simple solution snaps onto the front of your lens via a ring that screws into your filter threads. It worked great — as long as I used a zoom and didn’t have to change lenses frequently. So I ponied up for a Tilta matte box that had a swing away arm to enable easy lens changes, which mounted to rails for support. But this is a heavy solution, and over the years I’ve found myself leaving it at home when I rolled out on documentary shoots. When Genus invited me to review their Genus Production Mattebox, (which I’ll hence refer to as GPM) I was eager to try it out. Genus has a reputation for making matte boxes that are a good fit for filmmakers with simple needs. Here’s what I discovered. Relatively Light weight. 2.2 pounds with all flags attached (vs. 2.9 pounds for Tilta-but Tilta has swing-out arm and the GPM, although one can be added as an option). Deep French flag. The GPM has a nice, deep French flag which cuts 6.35″ of light off the top of your lens. By comparison, my Tilta is 2″ shallower. This extra depth goes a long way to reducing the amount of light hitting the lens. Love it! Multiple options for mounting. The GPM comes with two options for mounting the box to your lenses. For larger glass, use the included nun’s knickers. For lenses 82mm and smaller, use one of the half dozen included step-up rings, which vary in size between 52mm and 77mm. But the truth is, I don’t use any of these things. I simply align the box in front of my lens and start shooting. 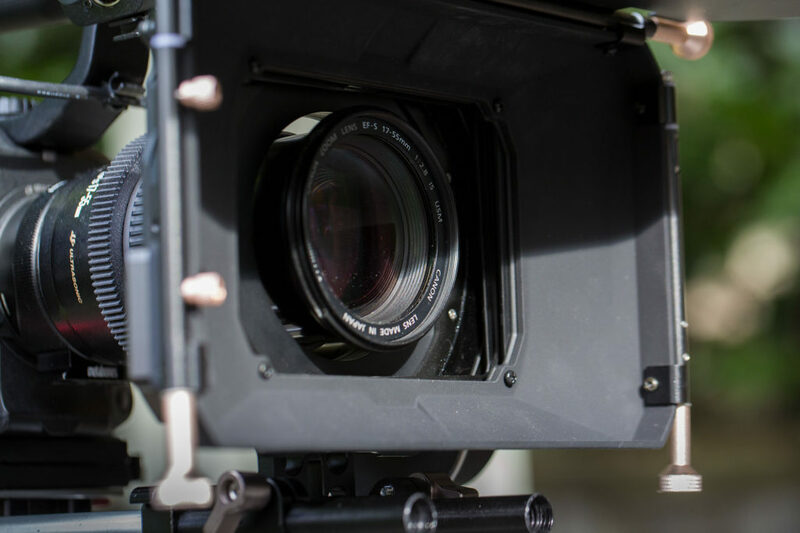 Since I use a matte box simply to keep light from striking and flaring the lens, it’s not necessary to block light from entering the rear of the box. This allows easy use with lenses the change length when focused, such as my Canon EFS 17-55mm f/2.8. 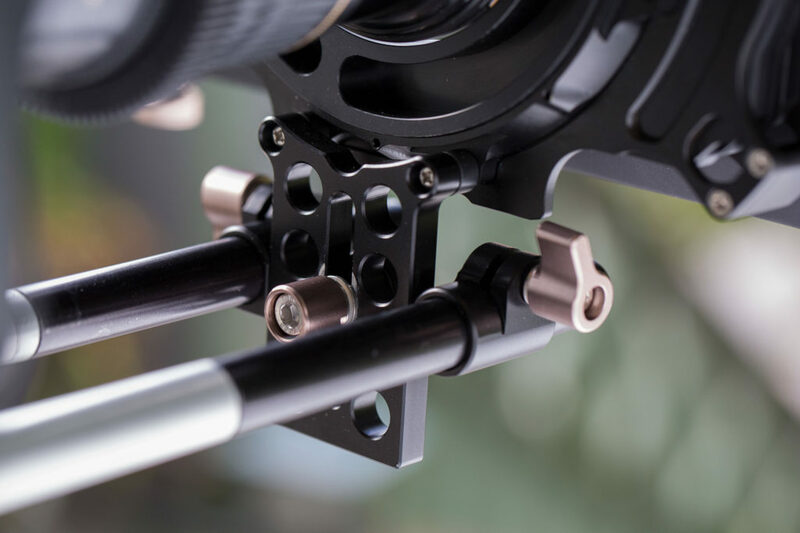 The reason you’d need to choose a mounting solution that blocks all light from the rear is if you’re using a filter in the tray, to eliminate reflections caused by light entering from the rear of the matte box. The Genus Production Matte Box (minus top flag) fits into a small 1400 Pelican case. Tip: I store the top flag in a side zipper compartment on my camera case. If I stored it in the Pelican case with the matte box, I would have to use a larger case. So it makes sense to break up those storage locations. No option for bottom flag. But then, I think I’ve only ever needed to use a bottom flag once in my entire career. So it’s not exactly something I lie awake at night worrying about. Lens changes are awkward without swing-away door. If you’re using prime lenses a lot (rather than the zooms that many documentary shooters prefer), this can be kind of a big deal. It’s a real pain to have to release the rail block, slide the box forward, change the lens, then slide it back and retighten it. But swing away arms add weight. And when it comes to matte boxes, I prefer lighter to heavier. Also, you will need the Genus Height Extension Bracket to adjust the box to the right height for different lenses. Wide-format tray. 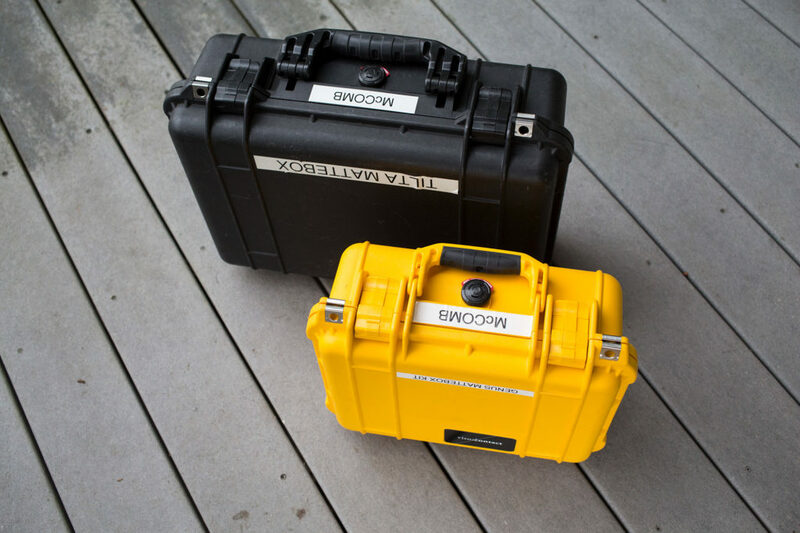 The GPM box accepts only 4 x 5.65 filters, and Genus offers no tray adapter for it to accept 4×4 filters. Even though most documentary shooters won’t be using filters anyway, I wish there were an option to use it with 4×4 filters, because, well, those are the only filters I own! And 4×4 filters are more common than the wide format ones. Update: Genus contacted me after this piece was posted with news they plan to make a 4×4 tray for the GPM. I look forward to testing it. At the end of the day, my favorite thing about the GPM is that it’s small and light enough that I find I DO actually take it with me on shoots. Even though it stays in its case most of the time, when I need it, it is there. Just like that visor when I’m driving into the sunset on my way home. This entry was posted in Product reviews on November 21, 2016 by Dan McComb. For my documentary film work, I’ve been pretty satisfied with my Tram TR50s over the past few years. But when the mic capsule came loose for the second time on one of them, I was in the mood to try something new. After reading some reviews, I picked the DPA D:screet 4061 lav mic. It’s modular, using micro-dot connector adapters that allow the mic to work with virtually any professional audio device (i.e., XLR, Sennheiser, Lectrosonics, etc). DPA makes a whole line of well designed accessories designed to make it easy to hide the mic. It sounds great under clothing using the included capsule for boosting high frequencies. It also comes with a capsule that boosts the mid frequencies for use when outside of clothing. The built quality is excellent, and it’s designed to withstand hours of sweaty performance. The biggest surprise with the 4061 is how great it sounds under clothing when hidden. And how easy it is to hide using the DMM0012 Miniature Concealer. DPA makes some special two-sided round tape (ADH0002 Double-Sided Tape for Miniature Concealer), which is amazing stuff. You place the mic in the concealer, apply a piece of tape, then stick the mic anywhere inside your subject’s clothing, or on their chest directly. Using this setup, the mic us MUCH quieter under clothing than my TR50s ever were. I’m not sure why, exactly, but I can tell you that it just works. Something about the capsule of the TR50 makes it especially sensitive to clothing rustle. One note: The DPA Microphones DPADH0004 double-sided tape costs $14 for 10 strips. When it arrived, I discovered it’s actually just Top-stick 1″x3″ toupe tape repackaged by DPA. You can buy 100 strips for the same price on Amazon. I’ve taken the time to decipher some of the materials described in this video. Molton cloth – it’s the European name for what we call Duvetyne here in the US. Double-sided tape – the brand he’s using in the video is called Ve-ge Double-sided transparent carpet tape and 2″ x 82′ roll costs $12 on Amazon. I’ve also had a Rode lav for a few years, and it’s another decent sounding mic for dialog that uses micro-dot connectors. However, Rode’s implementation of the connectors is much less robust than those found on the DPA mics. 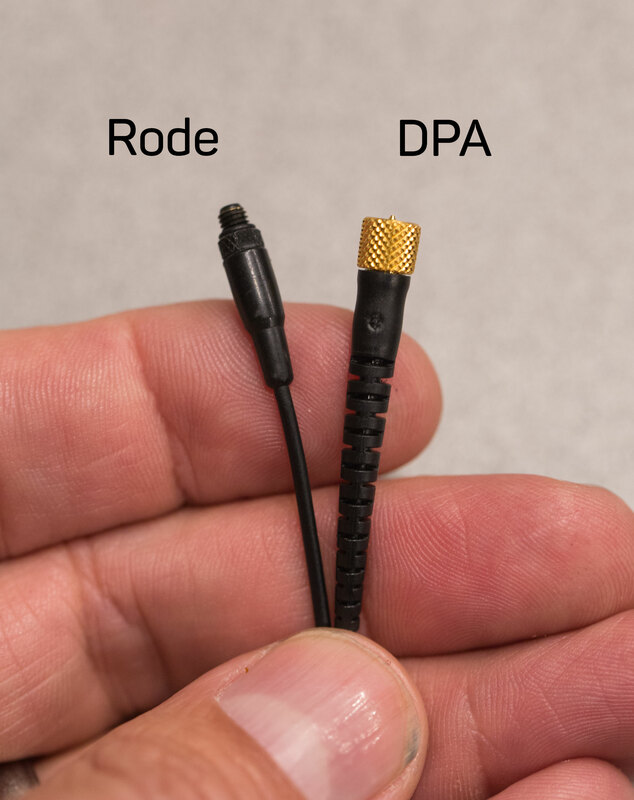 The DPA mic has a locking connector, which is thicker, while the Rode connectors do not lock, and feel pretty flimsy. But they have held solid so far. The Rode lav is also easy to hide under clothing using their Invisilav silicon mic concealers. But in my experience the double-sided tape on these tends to come off very easily, and is very fiddly to apply. The double-sided taping system that DPA makes for their concealer is definitely superior. If you’re looking to save money, the 4061 probably won’t be your first choice. The 4061 with microdot termination is $449. You’ll need to add at least one connector, and locking connector for Sennheiser Evolution wireless systems is $100; for an XLR connector it’s $115. 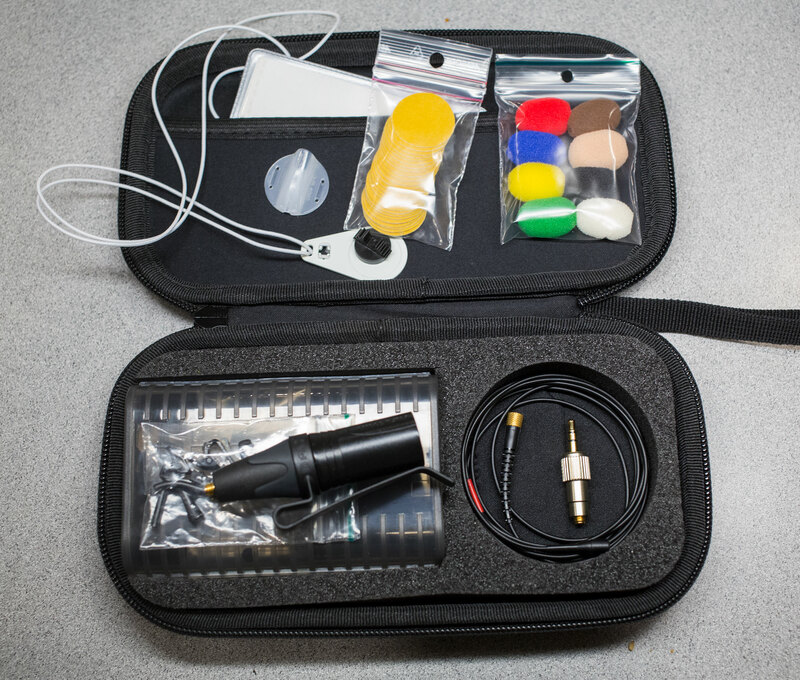 The accessory kit padded case, pictured above, adds another $134 and includes a magnetic connector. The mic alone comes in a smaller clear, hard-plastic case. The concealer and it’s yellow double-sided tape stickers is sold separately. The good news is that high-quality sound equipment evolves slowly (unlike cameras, which get upgrades every few months, it seems). It’s very likely that this mic will still be on the job 10 years from now. If you look at it that way, it’s a bargain! This entry was posted in Tips on November 19, 2016 by Dan McComb. It’s as bright as an Arri 650. It’s an LED. It’s rated at 98 cri. But wait, there’s more. 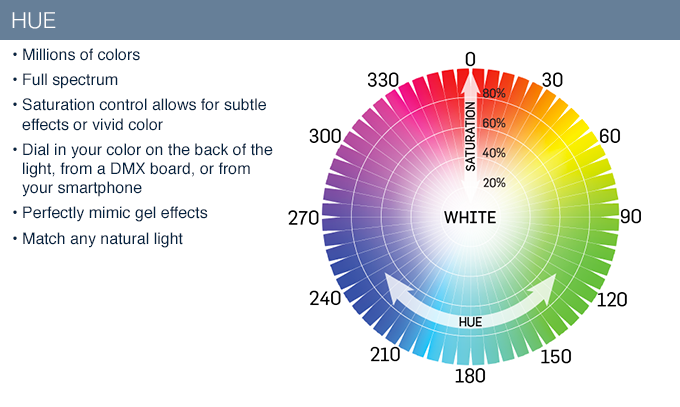 It can output any color in the spectrum. And it’s just $799? Wow, if this thing is for real, lighting junkies like me have a lot to look forward to. This beautiful piece of engineering from Hive Lighting is scheduled to begin shipping in March. Hive Lighting makes high-quality fixtures used in Hollywood productions, and they have earned a great reputation for innovation with their plasma lights. 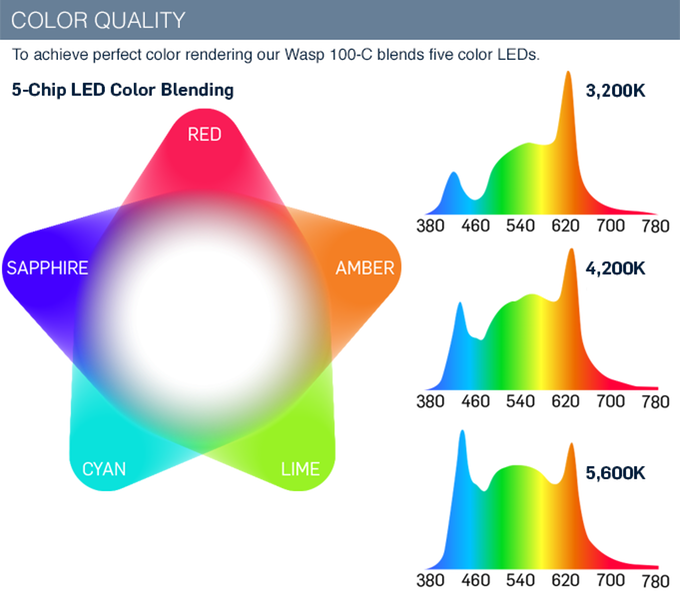 The WASP 100-C is their first foray into the fast-changing world of film LED lighting. The WASP 100-C will work with a wide range of accessories, including a mini source four attachment that should allow you to throw a narrow slice of light all the way across the room, no flagging required. The lights will sell for $1,200 normally, so this is a screaming good deal while the WASP 100-C ickstarter campaign is still going. This entry was posted in Tips on November 16, 2016 by Dan McComb.